The weather outside is starting to hint at spring, and that can mean only this: it’s maple syrup season! The glaze of boredom in the eyes of some Canadians when maple syrup is mentioned is as thick as any real maple glaze spread on a cake. Yet our official attachment to that product is so pronounced that no chef … can give an official Canadian dinner … without serving a maple-flavoured mousse, bombe, parfait, soufflé or whatever.… [O]ne may as well face up to the fact that a lot of dishes are made, and continue to be made, from tree sap. Canadian cuisine is not limited to maple, but maple is definitely one facet of Canadian cuisine, like it or not. I’m always on the lookout for recipes that use maple syrup as something other than a pancake topper and general-purpose sweetener. One that jumped out at me was eggs cooked in syrup. I first came across it in A Taste of Quebec; it also makes an appearance (apparently as a garnish) in the “Ploye à Champlain” in Au Pied de Cochon: The Album. A search through my other Canadian cookbooks came up empty, and I wondered why such an interesting-sounding dish was so poorly documented. Admittedly, part of what appealed to me about this recipe was the rusticity of the image it evoked: a pot of syrup bubbling away on a wood stove, as brunch was being cooked for the family in the Quebec hinterlands. More than that, though, it was the extravagant expense of using maple syrup as a cooking medium; maple syrup is not a cheap ingredient, and the idea that one could have enough of it on hand to use it to poach eggs just seemed too good to be true. So I decided to swallow the cost and try it out, to see if there was any value to it. I put a cup of pure maple syrup into my smallest saucepan and brought it to a simmer, then I cracked an egg into a bowl, slid it into the hot syrup, and let it set slightly before breaking it up and letting it cook through. After removing it with a slotted spoon, I served it over pancakes and (yes, maple-cured) bacon, drizzling some of the additional poaching syrup over top. If there is any value to this dish, it must lie in nostalgia. 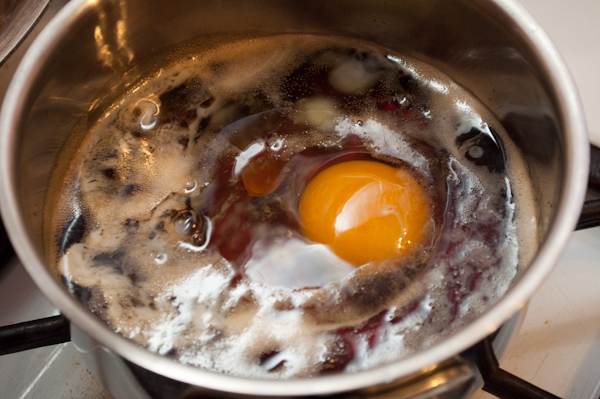 The egg was so saturated with the rich syrup that it was challenge to eat more than a couple of bites – I suddenly understood why the Taste of Quebec recipe calls for three eggs to serve six people, and why other references to this practice were so scarce. Moreover, it didn’t seem to know what it wanted to be: was it a dish of its own, to be a menu option alongside scrambled, poached and over easy? Or was it merely a garnish for the pancakes, a way of making the syrup more interesting? It wasn’t unpleasant to eat (though it was unpleasant to look at) but it’s not a dish I would cook again, except by request: there are too many other, better uses out there for maple syrup. What’s your favourite maple syrup preparation? Wait a minute, you broke the eggs up? I’ve hade eggs poached in maple syrup which were whole, and delicious. Once a year is enough of this “cabane à sucre” folly though! Jesse, I’ll be honest: I thought it was weird to break up the eggs, too, because eggs poached in syrup and left whole sound a lot better to me. But that is what both recipes called for! So I assumed it was the traditional approach. If I were to ever do this again, I probably would just leave them whole. © 2019 Kayahara.ca. All Rights Reserved.